Middleton Community Calendar from the Optimist Club. Does anyone really use a printed and bound dictionary anymore? I hear that asked whenever a dictionary donation program is mentioned and I always think, well, if they don't they should. There's something special about feeling the weight of a book in one's hand and actually flipping the pages to find what you are looking for presents a sense of accomplishment that one can't find or feel on Google. 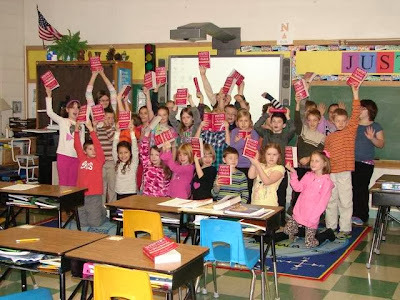 I'm happy to report that the Stevens Point Noon and Plover Optimist Clubs in Wisconsin recently donated 600 Webster's Encyclopedic Dictionaries to the third grade classes in their school districts. It was the 10th year that they the clubs have sponsored this activity. Shown here are some happy third graders from the St. Stephen Elementary School. 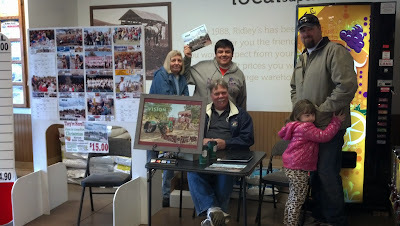 Thanks to the Stephens Point Optimist Club for the picture. I was searching for a picture today and I stumbled up on this presentation. 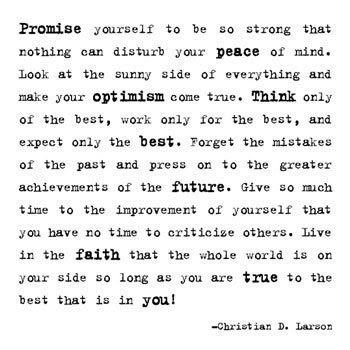 It was given by personal branding coach Christoph Trappe to the Optimist Club in Cedar Rapids, Iowa. I decided to share it here for three reasons. 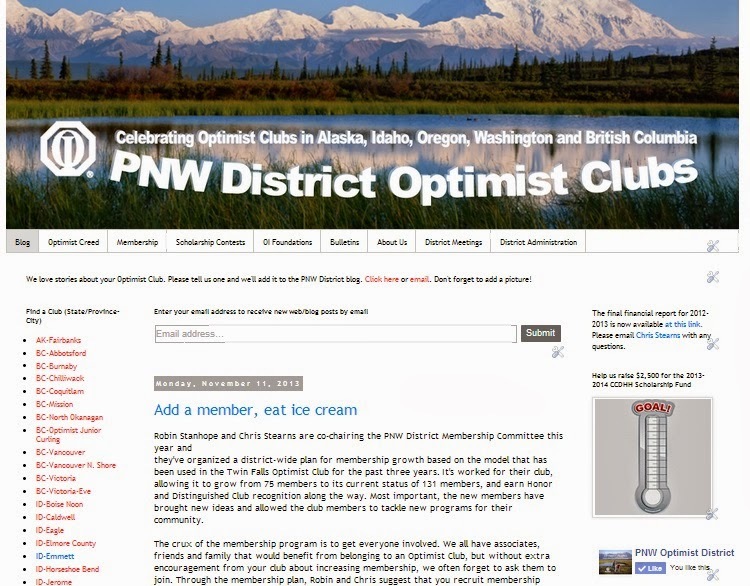 First, it provides an example of how businesses can interact with your Optimist Club. By giving them fifteen or twenty minutes to share their expertise with your club members, business owners can raise awareness for the services that they provide. Second, Mr. Trappe shared his experience of being at the Optimist Club on his community journalism blog: Christoph Trappe's Blog. That raises awareness for Optimist Clubs and provides authentic links to the organization's purpose. Finally, the slides tell a good story about why it's important to share what you do as an Optimist Club and why you do it. I believe that we want to make the world a better place to live and raise our families. Social media provides a point of entry to share that purpose with a cross section of the public. It's a perfect platform to tell your stories and inspire others with your good deeds. Okay, if you don't think that social media is a good thing for your Optimist Club at this point, perhaps you might want to try it out at work. Either way, you need to be online. The time frame is no longer when; it is now. The Optimist Club of Alexandria, Louisiana is just one of many Optimist Clubs who are honoring students this month. November is the traditional month for Optimist International Youth Appreciation although many clubs carry on youth appreciation activities throughout the year as they recognize students for academics, citizenship, and leadership, among other things. This brief video from the awards presentation explains more about the program. You can also learn more at Optimist International or find an Optimist Club near you to experience optimism in action. The Christmas season sends Optimist Clubs out into the cold for fundraising activities that include, among other things, Christmas Tree lots! Of course if you belong to an Optimist Club in Texas, you're not going to be as cold as you might be in the northern states.That's why the Alamo Heights Optimist Club Christmas Tree lot has been successful for 57 years. According to their publicity efforts, the Alamo Heights Optimist Club tree lot is the oldest and largest Christmas Tree lot in Texas and it's been manned by Optimist Club members at the same location, at the corner of Austin Hwy and Broadway, since its inception. 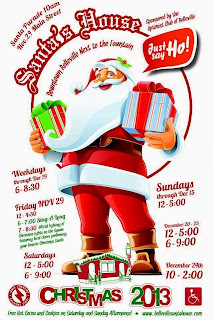 In addition to opening up the tree lot, the Optimist Club is engaged with all holiday festivities in the community. It participates in the holiday parade and it throws a party at the lot with a band as a kick-off celebration. All of the excitement starts on November 23. That's right. Christmas is only a little over thirty days away. Happy holidays are here. I'm starting to see a new challenge for Optimist Clubs and their publicity efforts. Just when they began to get more mentions in their local newspapers, the newspapers have put up paywalls. That's right; now in many locations, in order to see the good deeds and great pictures of your local Optimist Club at work you must be a digital subscriber to the newspaper. The best way to overcome this obstacle and to continue to get positive stories about your Optimist Club in the media is to write about your projects yourself. 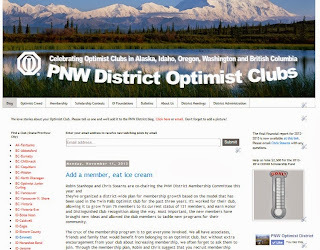 Start a blog, and like the Experience Optimism and PNW District Optimist Clubs blogs, your content will be available at all times. In addition to stories, you'll be able to promote events, publish contact information, spread inspiration, and share optimism with others. To get started, visit Blogger or Wordpress.com and just follow through. It's pretty easy if you follow the instructions. However, we can also work together to get your Optimist Club online. Would you like to work with me? Send a note now to Linda Vaught Jackson. I'd be honored to help your club create a public relations plan that helps it get noticed. Several years ago, Optimist International leaders began promoting a slight change in language for one to use when inviting someone to attend an Optimist Club meeting. Instead of using the word "meeting," they said you should invite someone to a breakfast, lunch, or gathering. It was their opinion that no one wanted to attend a meeting, but that they had to eat. Maybe so, but I know that I wouldn't be too pleased with a friend or an associate if they asked me to lunch only to find out that I was really part of a membership drive at their service club. And a gathering? Well, for me, that just brings to mind some sort of cult. My mind races to immortals, as depicted in the movie franchise "Highlander," when the gathering would bring all of their kind together to fight until there was only one. Post by Urbandale Optimist Club invites people, members and others, to attend a gathering. I admit that even I have promoted the use of online calendars to and press releases to promote Optimist Club guest speakers as forums and lectures as topics of general interest. I still stand behind that idea; however, I don't agree with obfuscating that your reason for bringing people together is to conduct an Optimist Club meeting. In meetings, we learn about issues, share ideas, and develop plans to address problems, promote goodness, and make our world a better place to live. Meetings are time-conscious. While there are always outliers, most meetings begin and end in a reasonable amount of time. Personally, I have no idea how long a gathering may last and depending on my schedule, I may not be willing to find out. Meetings provide a sense of formality. Please don't confuse being formal to wearing a suit and tie; it doesn't matter what you wear to the occasion. Formality means that someone is accountable for what happens before, during and after the meeting. Someone cares enough to engage others and see projects through to the end. I like the formality and accountability of the meeting process. I, for one, embrace the meeting and I encourage you to do so too. Can you believe it? In only three weeks, Santa will start making visits to local malls and houses set up just for him to visit with the public. In Belleville, Illinois, the Optimist Club has refurbished his house and set the hours when he will be entertaining guests, taking pictures and finding out just who has been naughty or nice. 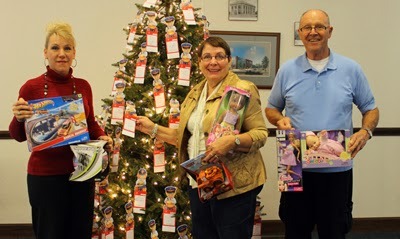 Other Optimist Clubs are planning other Santa events, like the Delphos Optimist Club in Ohio where community members are asked to help ensure that everyone has a gift by contributing to an angel tree. Set up as the Delphos Community Christmas Project, the angel tree has been part of the community for 37 years. Optimist Clubs help their communities in other ways during the holiday season and beyond. For the next two months, we'll be looking at food drives, coat drives and many other traditional community service activities including breakfasts with Santa as the big day draws near. Right now, we're asking for your help. Send us a story and a picture so we can highlight your holiday project as part of the good things that Optimist Clubs do to make their communities a better place to live. Please send to optimist [at] newoptimistclub [dot] com. Thank you. Labels: experience optimism, holiday, optimist club. I recently stopped receiving updates from Visual.ly, not because I didn't like them, but because my inbox was getting so full that even with the emails, I rarely went to the site to see what was new. Thanks to a pinner on Pinterest, this great depiction of "Inner State" of happiness, made at Visual.ly, caught my attention this morning. It says that to be truly happy one should exercise, have happy friends, find excitement with smart thrills, get enough sleep, trust themselves to make good choices, be present and live for now, share their gratitude, bounce back from life's troubles, take time away from technology and smile. Most of those wonderful thoughts have been shared here before, but they always bear repeating for they are good reminders to help us live a full and balanced life. But this post is serving two purposes this morning. First, it is to help you pursue and find happiness; but its second purpose is to point out that we don't always see something the first time around. I missed this great infographic on Visual.ly, but found it later on Pinterest. I've read the words before, but never in this format. It was a fresh approach and it caught my attention. That's why we have to repeat the information and stories that we want to be heard because people listen, read and react on their own schedules. If it's good for them to know, tell them again. And again.